Published in the series, Sociology of Crime, Law and Deviance, Volume 10. This volume presents recent insights in the sociological study of surveillance and governance in the context of criminal justice and other control strategies in contemporary societies. The collected chapters provide a varied set of theoretical perspectives and substantive research domains on the qualities and quantities of some of the most recent transformations of social control as well as their historical precursors in diverse social settings. Drawn from several quarters of the world, the contributors to this volume testify to the increasing relevance of surveillance and governance across the globe and, at the same time, demonstrate the cross-national spread of scholarly ideas on the study thereof. Traditionally, sociologists have contemplated power in terms of the institutions of politics and its modern apex, the state. Yet, because of many of the contemporary changes affecting the institutions and practices of surveillance and governance, it can be argued that social control today is less a domain of the nation-state alone. At the same time perhaps, never before has the state been involved with social control as much as today. Surveillance and control also are no longer an exclusively local or regional affair but extend beyond national boundaries to take up the sphere of the global order. Yet, at once, much control is localized and continues to go “down to the finest grain of the social body”. Also, many of the new technologies that a decade ago led to analytical reflections of the highest order today have become banal in their everyday application and routine diffusion. What can sociologists intelligently say about these developments in both empirical and theoretical respects? 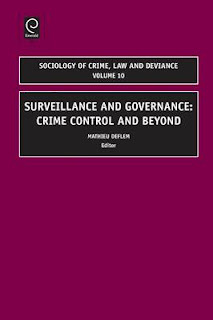 It is from this perspective that the authors of the present volume were invited to contribute a chapter in which they could freely explore any facet of the broader constellation of contemporary surveillance and governance strategies with respect to both crime control and related developments that push social control processes beyond the concerns of crime and deviance. Based on their research efforts, the contributors were encouraged to offer provocative and thoughtful reflections that can stimulate our theoretical thinking about relevant issues. The authors yield the very rich variety that exists in contemporary sociological thinking about surveillance and governance. This volume appears as Volume 10 in the series Sociology of Crime, Law and Deviance. Stéphane Leman-Langlois in Surveillance & Society (2009): "Both experts and those simply curious about the structure, evolution, sociology and politics of surveillance will find this collection of works intriguing and informative. Chapters are short and to the point... and cover an extremely varied lot of manifestations of surveillance in all its guises. Foucault’s ghost of course floats above the collection, well set up in Deflem’s introduction." Sawyer Sylvester in Law & Politics Book Review (2009): "SURVEILLANCE AND GOVERNANCE is a collection of essays offering a variety of contemporary examples of the use of information for social control... Although a few of the articles are fairly dense for those not fluent speakers of Foucault, the book as a whole is a useful source for a number of rich examples loosely connected to the common theme of surveillance. The surveillance society is not a new idea, but these articles demonstrate the breadth of the application of that idea both in crime control and other areas." Kendra Briken in Kritische Justiz (2011): "Die im Band Surveillance and Governance von Mathieu Deflem versammelten Artikelhingegen verlieren sich nicht im Labyrinth der Lösungen, was, der Titel verrät es bereits, ihre gouvernementalitätstheoretische Klammer zuverhindern weiß." LEX VIGILATORIA: GLOBAL CONTROL WITHOUT A STATE? This book is available as pdf file. Physical copies of this book are available in online stores and via resellers. See other edited books by Mathieu Deflem.